As promised, I am back with some more exciting and fresh updates. Good progress has been made! 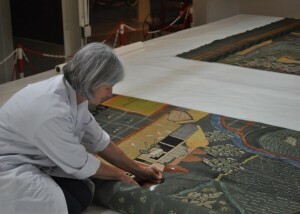 The first week flew by in the setting up of and preliminary preparations for the conservation project of the first 1951 wall hanging. In the second week I felt myself drifting off far away, swayed by the humming sound of the controlled variable suction vacuum cleaner as I continued to rhythmically surface-clean both the front and back of the wall hanging. I felt completely in tune with myself. I pictured myself in the beautiful countryside of Kent and imagined how farming life would have been back in the 1950s, helped by how the resist-dyed wall hanging has a plethora of so many vibrant colours. Then, Kate also examined the two holes in the wall hanging. 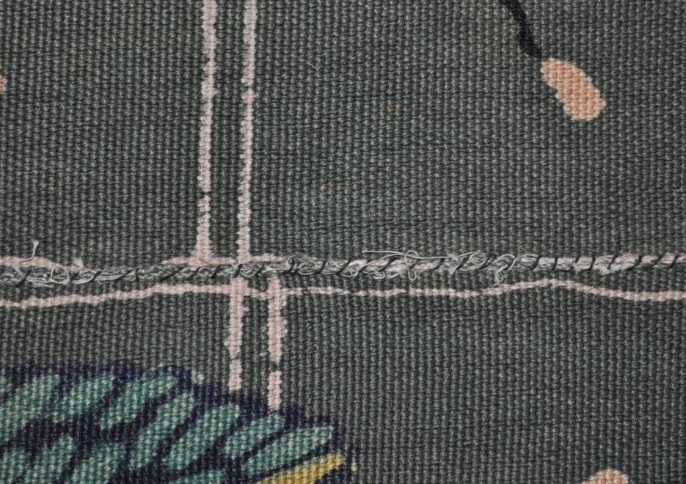 The first was a small square like shaped with frayed edges shown below in the picture on one of the orange Oast Houseroofsand the other was a bigger hole on the green patch in a more elongated shape. 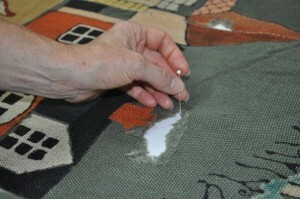 There were some old repairs on the centre seam which were causing damage to the wall hanging. Kate thoroughly examined its condition and decided that the best treatment to preserve it was to remove the old repairs. I shall leave you to digest the same excitement that I felt while assisting on this unique project. Watch this space for more interesting insights into the conservation of the 1951 wall hangings… until then you are very welcome to come and meet us at the Museum of English Rural Life where you can see the real action happening! 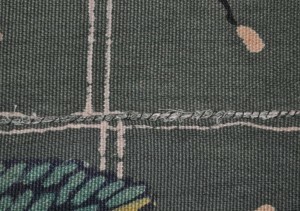 This entry was posted in Conservation and tagged 1951, art, conservation, kate gill, Michael O'Connell, nitisha ramrekha, Our Country Lives, textile, wall hanging. Bookmark the permalink.